Always poignant, the two minutes silence on Armistice Day is closely observed at BGS. On the 11th hour of the 11th day of the 11th month, classrooms fall silent and pupils on the playing fields draw a halt in their sporting endeavours to come together, heads bowed, and remember all those who have lost their lives in active service during and since the Great War. WW1 affected everyone and its legacy continues to help shape and define our future. A future which, thanks to the sacrifices made by the many, is for our girls one blessed with freedom and possibility. For the girls of our legacy schools, Bedford High and Dame Alice, the war took away their brothers, their fathers, and their future husbands. Evie Cox (née Dickens, a former pupil of Bedford Girls’ Modern School) wrote: “The First World War coloured most of my schooldays. I remember so well the sound of the military bands passing over the Town Bridge on their way from the Barracks to the Cemetery. I never hear Chopin’s funeral march without being transported in imagination to that prep room”. Indeed, for the alumnae the end of the war bought irrevocable changes. The granting of women’s suffrage, the advancement of women away from the home and into the workplace and the numbers of widows and fatherless children left by the million high death toll of the trenches had altered things for ever. By the end of the First World War, 37% of British Women were employed and the nature of their occupations was changing. As austerity tore at the fabric of the aristocracy and women took on previously male preserves such as working in munitions factories, fewer and fewer women were employed in service and even greater numbers began to see a brighter future. 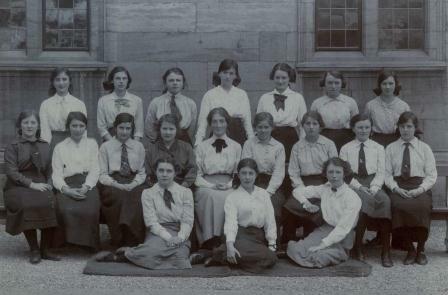 Similarly, BGMS alumnae would be entering the professions reserved for men for the very first time, they would be allowed to go to universities such as Oxford and Cambridge and enter a world where at last they had more rights. But for some the devastation was overwhelming, they continued to mourn lost loves yet often, although often never marrying, they made the very best of the new educational opportunities available to them and devoted their lives to inspiring a love of learning in the next generation of girls and young women. At our Remembrance Assembly poems were read out by Year 10, The Last Post was played and as the clock struck 11am the school fell silent for two unbroken minutes. Our history is very important to us. Over the next four years we will be marking the century of the beginning of WW1, 28th July 1914, and the end of WW1, 11th November 1918. We will remember the brothers lost, the fathers killed and the changes it bought not just to the country but to our own community. The war changed things for ever. Today we remember not just those who have lost their lives in conflict but all those who conflict affects. We remember too how the devastation of war can make way for sweeping and positive social change and, ultimately, a more cohesive and fairer world.